Family friendly updated 3 bedroom cottage is located on a beautiful, crystal clear lake, that enjoys plenty of natural shoreline. There are 3 spacious decks on the grounds, which include a large 40 foot cottage deck, a suspended deck above the water and a waterfront wharf, attached to a 8' X 16' floating dock. This cottage enjoys a beautiful view out over the lake, and a fantastic shallow sand bottom swim area. The shoreline is natural rock and the property is typical rugged Muskoka, Canadian shield with a natural pathway leading to the waterfront area. Inside, the cottage is beautifully appointed with hardwood flooring, soaring 20+ foot vaulted cedar ceilings along with oversized tall windows reaching up to the cathedral ceiling allowing plenty of natural light into the cottage and providing an unobstructed view out to the lake. The two large bedrooms are located on the main floor with closet space and dressers while the loft area is a great spot for the kids, with plenty of room to play, watch TV and sleep. The kitchen is open to the dining area with plenty of counter space, while the living area has 3 plush leather couches to watch TV or catch a movie. There are two full bathrooms, one located on the main floor and the other in the loft, both with floor to ceiling natural stone appointments and creature comforts of home. Come and enjoy life at the cottage as the wind whispers through the tall towering pines, while you sit on the deck and take in the natural beauty of the surroundings here on High Lake. Only 2 hours from Toronto! We have been renting our cottage for 5 very successful years and many of our renters are return customers. Being a carpenter with appreciation for beautiful wood work, I have transformed our cottage into a prime rental property, offering all the comforts of home that our renters have come to expect. As an outdoor enthusiast, I love boating on our quiet lake and hiking on the nearby trails. My wife and I, along with our four children, have made many beautiful memories at our lakefront cottage and our renters have made their own also. I have enjoyed receiving many emails of appreciation from our customers, wishing our cottage was theirs. I look forward to many more seasons renting to families wishing to embark on a Muskoka adventure. 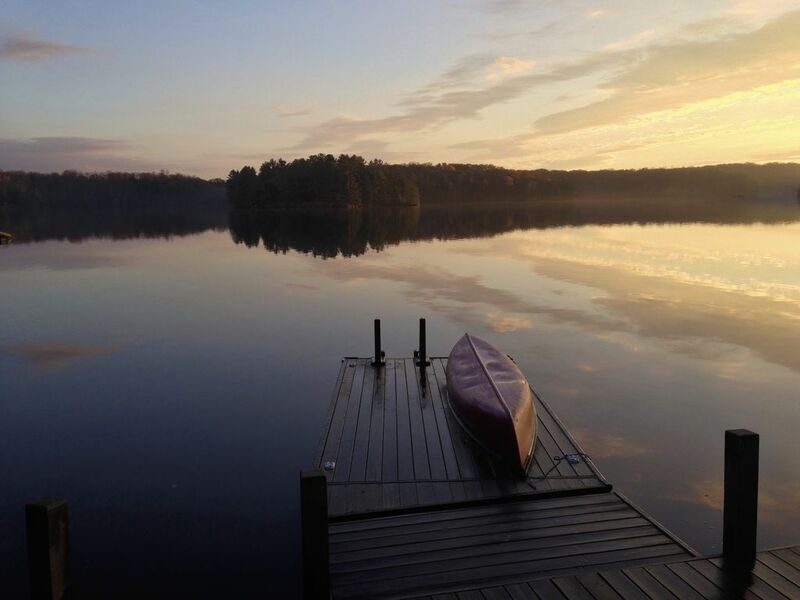 This Muskoka dream cottage has it all and offers our renters a true Muskoka experience. From vaulted cedar ceilings to expansive window views of the lake this modern cottage has it all. Our cottage is situated in a beautiful natural setting away from busy roads and bustling centres. That being said, we are close to many fantastic points of interest. Downtown Rosseau, Bracebridge, Huntsville and Port Carling are all a short car ride away and offer our renters unique Muskoka memories, whether is be for touring, shopping or dining. High lake is a pristine Muskoka lake that offers our renters the ultimate waterfront experience. With under 50 homes in total, our renters enjoy natural and rugged waterfront views. Our cottage is centrally located on the lake with a south western exposure. Sit back on the dock in our Muskoka chairs and let the hours pass by while the waves gently lap the shore. Whether you are taking in the view of the nearby islands or enjoying beautiful sunsets, the hours in the day seem to fly by. Updated bathroom on main level has a toilet, sink, tub/shower with a designer shower door. Brand new bathroom (Spring 2013) in loft has a toliet, sink and shower with a designer shower door and rainfall shower faucet. Both bathroom feature floor to ceiling stone and built in cabinetry. Breathtaking sunsets! Enjoy the peaceful scenery. Lots of nature surrounding you. Crystal clear lake, soft sand no weeds. Gradual entrance into the warm spring fed lake. 3 tiered decks let you enjoy the waterfront on different levels. Blankets, comforters and pillows are provided. Renters responsible for supplying their own sheets. Front loading washer and dryer is available. We include laundry detergent. Wood stove fireplace with wood is available for use. Wood floors throughout the main level give this cottage a clean upgraded look. The main area of the cottage is open concept, making family time easy and enjoyable. Cottage comes complete with full complement of dinnerware and cutlery as well as cooking utensils. Kitchen is well appointed, bright, airy and open to the dining and family room. Television in family room, master bedroom and 2nd main floor bedroom. Individual satellite receiver boxes located in family room and master bedroom. 2nd main floor bedroom wired to family room receiver. I-pod tower located in family room capable of playing music and charging. Assortment of books and magazines available. Assortment of board games in loft. Sony Playstation including NHL hockey game provided in loft. Large, new 40 foot upper deck attached to cottage. Suspended lower deck above waterfront. Third lower waterfront wharf with attached 8' X 16' floating dock. Assortment of life jackets of various sizes provided. Off site nearby public tennis courts available. Boat launch is located on lake. Golf and tennis available at nearby resorts. Great Cottage in great location. We are glad you enjoyed your stay at the cottage. We llook forward to many returns. A true slice of Muskoka paradise!! We spent two weeks enjoying the mostly peaceful (with minor exceptions for a noisy jet ski or two) Muskoka environment which this cottage provided. Lots of room to accommodate 8 to 9 people; well laid out interior with very nice wood details. Beautiful bathrooms as well. We really enjoyed the fairly easy access to the water for both swimming and boating activities. Close proximity to Huntsville; Bracebridge; and Rosseau for grocery shopping needs. There is also a small general store located at Bent River - good place to purchase firewood and water jugs for the water cooler, as well as a few other items. Also not too far from the Crossroads Restaurant, located in Rosseau, which serves fabulous meals. The cottage owners were extremely responsive to any of our concerns or questions, and very pleasant to deal with. Will definitely consider returning some time in the future. Hi Paul. Thank you for staying with us. It was a pleasure having you. We are glad that you and your family truly enjoyed the cottage and the surrounding area. We look forward to having you back next summer. Wonderful clean and relaxing cottage on quiet lake. We enjoyed our week long escape to High lake. The cottage and property are well maintained and the view each day of the lake was awesome. Quiet surroundings made this escape to nature relaxing and rejuvenating. The lake was perfect for swimming, canoeing, or taking the paddle boat out for a ride. Despite the heat in the city, a cool breeze at night from the lake helped us sleep each night and relax each day. This cottage is clean with all of the comforts from home. Some very fine woodwork throughout the cottage adds to the beauty of the interior. Three spacious bedrooms and two bathrooms each with a shower made it easier for our family of five. We had a wonderful relaxing week and would love to return next year. Thank you for your kind words. We always love hearing from the many renters that enjoyed our cottage and it’s beautiful surroundings. It’s equally nice that you appreciated the beautiful features of our cottage and property, which enhances the true Muskoka experience many are seeking. We would love to have you back as a valued renter in the future and hope you enjoy the rest of your summer. It is a beautiful cottage on the High lake .Everything was perfect from the beds to the furniture was almost like home.I would stay again there . Myself and my husband and older boys 20 and 17 decided this was where we were going to spend a week this summer. We allowed them each to bring a friend so the 4 males had the loft which worked out perfect, they slept in, stayed up late, watched movies and hung out in their own space. We also had a couple join us while we were there and we just had a great time. We loved the space, the option of a TV which we actually had on in the morning while we were cooking breakfast. We used all the boats and especially loved the SUP which we didn't even know were we getting until a few days before. When I was booking this the reason that I chose this cottage was a) the width of the dock so that many people could sit down there and not trip over each other, b) I also loved the loft with its own bathroom 👍🏻, C) all the outdoor seating areas and d) the shallow water area, To me these little things set this cottage apart from the rest. My boys love fishing and they didn't even spend that much time fishing we all just sat by the dock and enjoyed the water and each other, they didn't catch any fish but still had a fabulous week. I did bring a floating island and we spent a lot of time relaxing in it as well. From start to finish this was by far the best cottage rental I have done. Thank you! There were 8 of us total. 4 adults and 4 kids (7,9, twin 15 year olds). Canadians by birth who live in the US my brother and I are drawn every summer to the lakes in Ontatio. This place was a gem! The directions were perfect. If you could hear us when we unlocked the door and walked into "the great room" with the WINDOWS and high ceilings you would have heard "ooooooo. aaaahhhh, ommygosh LOOK AT THE DOCK"
The 4 kids got the loft and were thrilled and even appreciated the gorgeous bathroom. The 2 main bedrooms were perfect, comfortable, clean. The bathroom on the main floor is gorgeous too. We lived on the dock mostly and loved using your canoe, kayak, paddleboat and paddleboard. We also brought 2 kayaks and all of us had a blast touring the lake, listening to the loons, and even fishing (not much luck but it didn't matter). On the one or two times the weather was rainy we gathered around the giant and perfect dining table for games OR we watched something fun on tv that was suitable and made us all happy (American Ninja Warrior- lol). The grill is great. We also brought two hammocks and that was a blast. All in all, we laughed a lot and more importantly made memories. For an extra treat you can go to Lake Rousseau a 15 min drive and rent a speedboat and go tubing which we also did. The kitchen was great and the washer/dryer was incredibly handy right there! Love this place! Thank you Carolyn and Lawrence! Stunning, natural waterfall, located 2 kms from the cottage in beautiful Fish Hatchery Park. Every Friday in July and August enjoy Rosseau's Farmer's Market, featuring local artists and home baked treats.